Day 1 : for the Shuttle trasport will be from Calama Airport EL LOA. Valle de la Luna tour: will start from supplier office located in Caracoles street corner with Tocopilla street. San Pedro de Atacama. 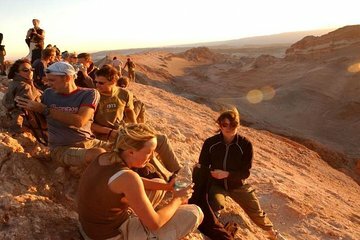 All the morning services start from centrally located hotels in San Pedro de Atacama town. Day 2: Piedras Rojas tour, from your hotel. Day 3: Geyser del Tatio, from your hotel. Laguna Cejar, will start from supplier office located in Caracoles street corner with Tocopilla street. San Pedro de Atacama. Day 4: Transfer out,from your hotel. Please send your Flight details (nr of flight, time of arrival and date) to program the pick up transfer to your hotel. Is important you send us the full passport information of each traveller at least 1 week before start the service. Please send your hotel information, in you are in a Hotel outside the pick up zone we will give you the meeting point in the suplier office, centrally located.